Budget smartwatches like the DZ09 are becoming more affordable and are coming with more features than ever before. In this article, we will compare many different affordable smartwatches to find the right one for you. We will also examine the functionality of a budget smartwatch to more costly models. Here we will compare the popular DZ09 to the GT08 Smartwatch. Both smartwatches have similar display screen sizes, but the DZ09 comes ahead with a slightly bigger screen at 1.56 inches compared to the GT08 at 1.54 inches. This is hardly noticeable when looking at the two watch faces. The DZ09 has more initial memory at 128 MB compared to the competitor at 64 MB. Though, both devices come with a microSIM card slot and a microSD slot which can expand the memory to 32 GB. When it comes to battery size, the DZ09 pulls ahead with a 380 mAH Li-ion battery. The GT08 isn't far behind with a 350 mAH. Both watches hold an average use time of approx 48 hours. Typical use is considered a mixture of utilizing the watches functions as well as idle time in-between use. When using Bluetooth and 3g with a SIM card, the battery life on the DZ09 is about 8 hours. The GT08 is close behind at 7 to 7.5 hours. Though, when you are using multiple features and utilizing calling much more with a SIM card connecting the devices to the internet, the lifespan is much lower at around 3 hours per each watch. Both watches contain the same sensors. These sensors include a G-Sensor, Pedometer, Sleep Monitor, and a Sedentary Reminder. Cameras are laid out on both watches but in different places. The DZ09 camera is on the front of the watch at a slight angle. This is great for taking pictures in front of you while looking at your watch. The GT08 has a front-facing camera. The DZ09 has a higher quality camera at .3 MP where the GT08 is rated at .08 Megapixels. The DZ09 has a traditional watch band strap that is made of silicone. The GT08 is made similarity but has a button clasp within the silicone. Both devices are very affordable for their features. The DZ09 is in the range of $10 - $20 and the GT08 is marginally cheaper at $5 to $20. SPECS for both devices listed below for easy comparison. The DZ09 has a slightly larger screen size at 1.56 compared to the Q18 at 1.54 Inches. They are both exactly the same with 240 x 240 Pixels. The Q18 has a larger battery than the DZ09. The DZ09 has a battery 300 mAH, and the Q18 has a 500 mAH battery size. The Q18 has a slightly louder speaker. The most significant benefit of the speaker is the placement which is front facing on the watch. The camera is rated at 1.3 MP for the Q18 and .3 for the DZ09. The placement of the camera on both watches is offset and looking at an angle instead of perfectly front facing. I have seen some reports that the watch bands on the Q18 last longer than on the DZ09. Some users who utilize the watch daily have reported the DZ09 watch straps breaking. The DZ09 watch band is less flexible compared to the Q18. The Q18 holds a downward facing watch band that contours better to the shape of your wrist. Here we will compare the DZ09 to the U8 Smartwatch. Both watches are pictured above. The U8 has one of the smaller displays at 1.48in versus the DZ09 at 1.56 inches. The resolution also is less with 128x128 pixels compared to the DZ09 at 240x240 pixels. They have the same initial memory, and both have the capability to increase to 32 GB with an additional microSD card. The battery size is less in the U8 at 230mAh. The Dz09 holds a battery rated at 380 mAh. The use time really depends on how many features you are using on either device. Both units state a use time of about 48 hours with light to regular use. The most notable difference is the U8 does not have a camera. The DZ09 does have an angled camera at .3 megapixels. The GV18 has a similar screen size of 1.54 compared to the 1.56 of the DZ09. The Pixel resolution is the same at 240x240. The DZ09 has double the initial memory at 128 compared to the GV18 at 65 MB. Both can increase to a memory of 32 GB with an additional microSD card added in place. The battery is one of the highest we have looked at. The battery rating is 450 mAh compared to the DZ09 which has a decent battery as well at 380 mAh. Both devices have a camera on the front of the watch at an angle. They do not have a perfect front facing camera. The MP rating for the GV18 is 1.3 MP where the DZ09 falls behind at .3 MP. The A1 has a slightly smaller display at 1.54 inches compared to the DZ09 at 1.56 inches. The resolution is the same with both being at 240x240 pixels. The memory is also the same. Both units have an initial memory of 128 MB which can both increase to 32 GB with an added microSD card. The battery size is also the same at a capacity of 380 mAh Li-ion. This unit dramatically differs in camera quality. The DZ09 is at a .3 camera MP rating where the A1 boasts a 2 MP camera. All of the devices that I listed above, you can use the calling function via a separately purchased SIM card, or you can make calls by connecting to your Smartphone via Bluetooth. If you are looking for a device that is still affordable but comes with more features, you will find some great devices at the $50-100 price point. 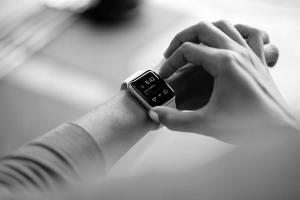 The smartwatches listed above can start lagging over time as they have limited memory. It is sometimes worth spending a little bit more to get the quality you are looking for. The following models come with more features. The cost is still reasonable and actually much cheaper than the big name brands. The features included with these models will provide you with much more for the few extra dollars spent. Features of this model include GPS and a heart rate monitor. It is great for tracking activity and also includes consists of a pedometer that tracks calories. The device also has a Sleep Monitor to track your sleep quality. Another unique feature compared to cheaper models is a "weather report" function. The smartwatch is water resistant but not waterproof. The unit does NOT have a camera. The official website of the smartwatch shows off their battery strength. The watch lasts for 45 days with light to regular use of the device. This smartwatch Looks more like a traditional watch with a round face and has many different styles of watch bands. Most come with a leather band, but you can customize it with many different styles. The watch automatically keeps the correct time and date. The battery is unique than the other watches that I looked at. It has a CR2430 coin-cell battery instead of a Lithium Ion. So, it is not rechargeable. Some of its main features include an activity, sleep tracker, a phone finder and music control. Bluetooth is enabled on this watch, and the watch is water resistant. The most notable features of this watch are its unique look for a smartwatch and the many different band styles that you can change out on this device to create different looks. VTech Kidizoom is a great watch for kids. The watch comes in bright Pink, Blue, Purple, and a few others. The touch screen size is 1.44 inches with a pixel resolution of 320 x 240 pixels. The internal memory is 256 MB. It is crucial to note that this is not expandable. The watch does not have any slots for a microSD card or a SIM card. This watch will not be able to make any phone calls. The VTech has two cameras rated at .3 MP. One is offset on the front of the watch, and the other is a front-facing camera. The watch also records videos at a max length of 60 seconds. This watch does not have any activity trackers or GPS to protect your children's data and location. The sensors built into this watch are a motion sensor and pedometer. A speaker and a microphone are both built into the device so that music can be played or sound could be heard in videos that are recorded by the user. A rechargeable Lithium-Ion battery is built into the device. With light to medium use, the watch will last 2 to 3 days. Other features for this smartwatch include: a clock, games, stopwatch, voice recorder, alarm, and timer. It is important to note that it is splash and sweat proof - but not waterproof. You can download more games from their "Learning Lodge" but does not connect to the google play store or Apple apps.